(MINNEAPOLIS)— Augsburg College physical education and exercise science students will use knowledge gained in the classroom to deliver smiles to more than 250 grade-school and middle-school children who will be at the 15th Annual Sports Extravaganza, a one-day event through which children with physical, cognitive and learning disabilities play on campus. The success of Sports Extravaganza, slated for November 18, hinges upon the participation of Augsburg students. 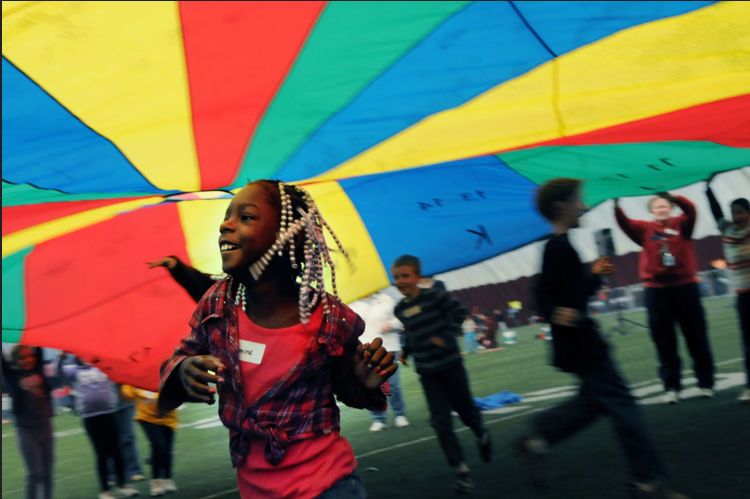 Together, students and faculty members create activity stations in the Augsburg Athletics dome and then assist children with each activity. Sports Extravaganza is an opportunity for College students to teach a young population they may not have worked with previously. Augsburg students problem solve, use encouraging messages and motivation techniques, and increase their adeptness at instructing children with disabilities. Event participants play games and complete activities that include bowling, soccer, relay races, dancing and more. The carefully planned stations have emotional and physical benefits for the children who rarely get to deeply participate in physical activities. Sports Extravaganza was founded in 1999 and continues to be an annual College tradition due to its myriad benefits for Twin Cities area children and Augsburg students enrolled in nearly a half-dozen HPE courses. This year’s Sports Extravaganza was organized by Enke and three teachers who instruct developmental adapted physical education in Twin Cities metro area suburban primary schools. Sports Extravaganza students will be on campus from more than 25 schools from Bloomington, Buffalo, Minneapolis, Oakdale, Richfield, St. Paul and Wayzata. Sports Games: 10 – 11:30 a.m. Lunch: 11:30 a.m. – 12 p.m.
Sports Games: 12 – 1:15 p.m.
All attendees, the majority of whom are less than 18 years of age, have signed media releases on file with their participating school.